In 1823, four years after the Cherokee Indians ceded their land to the United States the State Legislature passed an act transferring the county seat of McMinn County from Calhoun to the new village of Athens. On November 2, 1823 the Reverend William Eagleton organized a small group of Presbyterians into Mars Hill Presbyterian Church. The first sanctuary was a temporary house near the First Baptist Grounds a half mile south of Athens. The State Legislature granted the young church two acres in what is now Cedar Grove Cemetery. The Church rolls grew from 15 communicants in 1825 to 162 in 1833. 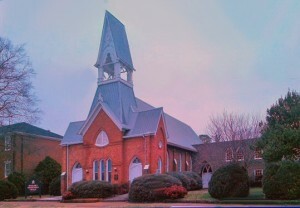 The members met in a brush arbor, in the Academy, and probably in the nearby Baptist Church, until 1838 when a brick sanctuary was completed on Lot No. 19 on North Jackson Street. In 1842 an annual fall camp meeting was held at the Beth Salem Camp Ground lasting several days. These meetings were continued through 1855. The Civil War divided not only the country but the Presbyterian denomination as well. Athens and Mars Hill Presbyterian Church were right in the middle of the conflict. Loyalties of the members were divided causing friction and dispute. Feuding between the northern and southern contingents continued until 1886. After years of contention Mars Hill was associated the the Knoxville Presbytery of the southern denomination (PCUS). The small congregation of 64 members, who had been "renting" the sanctuary since 1871, now occupied it as the legal owners. The building had suffered great neglect during the long interval since 1863 and was in a sad state of disrepair. In June, 1876 a committee was formed to oversee repair and renovation of the structure. There were difficulties with the contractor and the work was not completed. In June, 1878 a third committee took over the duties of repair and renovation. The sanctuary was essentially rebuilt joining the vestibule built in 1876. The new sanctuary was dedicated on the third Sabbath of December, 1878 and continues to serve the congregation to the present day. The church's bell, forged in 1837, is still rung for services. In 1906 a white frame building was built on the lot south of the church and served as a manse which proved attractive to prospective ministers. The salaries paid the ministers began to raise appreciably after 1908, reflecting the general prosperity and financial recovery from the ravages of the Civil War. In 1923 the church celebrated its centennial. As part of the anniversary new pews were purchased to replace the folding chairs which were noisy and unsatisfactory. The depression which enveloped the country in 1929 had a severe effect on the church which struggled financially through the next decade. By 1941 the church had outgrown its facilities and Sunday school classes were meeting in the manse. The church started purchasing war bonds, hoping to accumulate enough money to build an educational wing beside the church at the conclusion of the war. In January of 1944 the pastor announced his induction into the army as a chaplain. The session expressed surprise and hope that he would return when the war was won. That same night an electrical fire in the organ caused damaged to the chancel area, destroyed the organ, and caused heat and smoke damage to the rest of the sanctuary. The Session and Board of Deacons were faced with the double challenges of repairing the fire damage and filling the pulpit. The sanctuary was repaired to allow services by June, but the organ was not replaced until 1947. The old wooden manse was still in use for Sunday school, but time had taken its toll on the building. A decision had to be made, either a new home for the pastor or a new educational wing. Plans were drawn and funds raised for education. By the fall of 1949 the new facilities were in use. 1953 Built the new manse in Gettys Park. 1955 Tore down the old manse at the church, repaired the belfry and steeple. (Expansion plans were in the works for a Southern addition). 1960 Construction began on southern education wing and extension of sanctuary to include choir loft and new pulpits. Covered the patio between the two educational wings. Covered the old floor with hardwood. 1969 Dr. Roy Epperson bought the lot behind the church and gave it to the church. Congregation wanted to use it for a youth play area. It is now almost all parking space. 1971 and 72, Deacons did major repair, paved the patio, sent stained glass out for repair, made extensive repairs to old education wing. 1977 Rebuilt the bell tower to restore its original appearance. 1985 Completed installing central air conditioning and heating system. 1986 New Manse was renovated. 1987-88 Major expansion included developing the fellowship hall and enclosure of the patio, choir rooms and classrooms, connection of second floor of the two educational wings, demolition of the house and pavement of the parking lot. Lowered the hall entry from the old building into the sanctuary. Completed in 1988 and dedicated as Fisher Wing June 3, 1990. 1996 Installed Plexiglas outside the stained glass windows of the sanctuary. 2002 Moved church office downstairs, making the upstairs space available for an adult Sunday School classroom. 2006 rewired sanctuary lights, replacing the frayed and dangerous wiring. 2007 Installed new pipe organ given by Virginia Walthall. Johnny Coffman learns how to “operate” it.